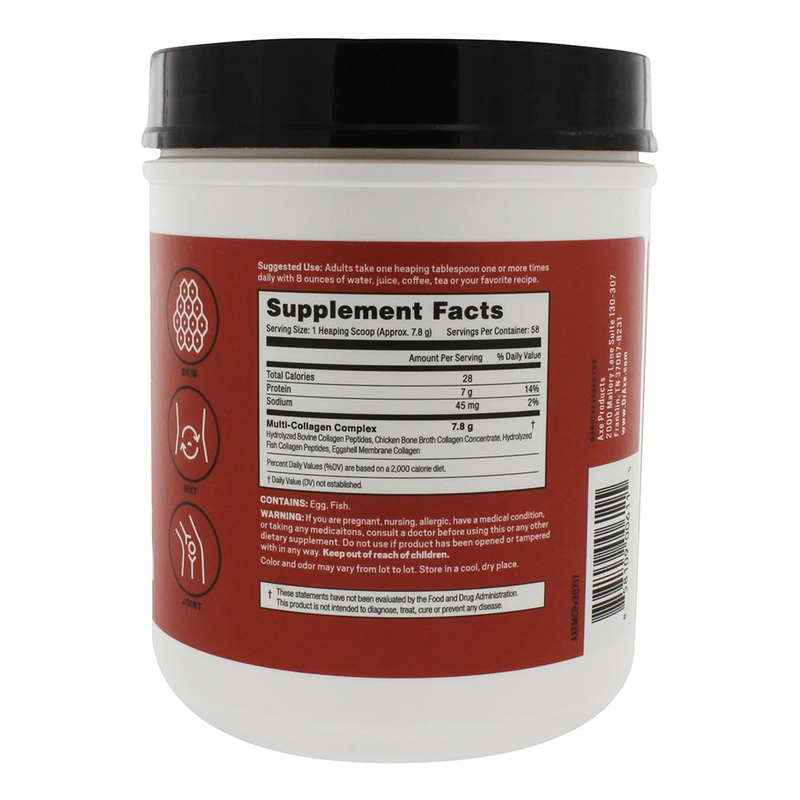 Ancient Nutrition Multi Collagen Protein Powder contains five types of food source collagen. 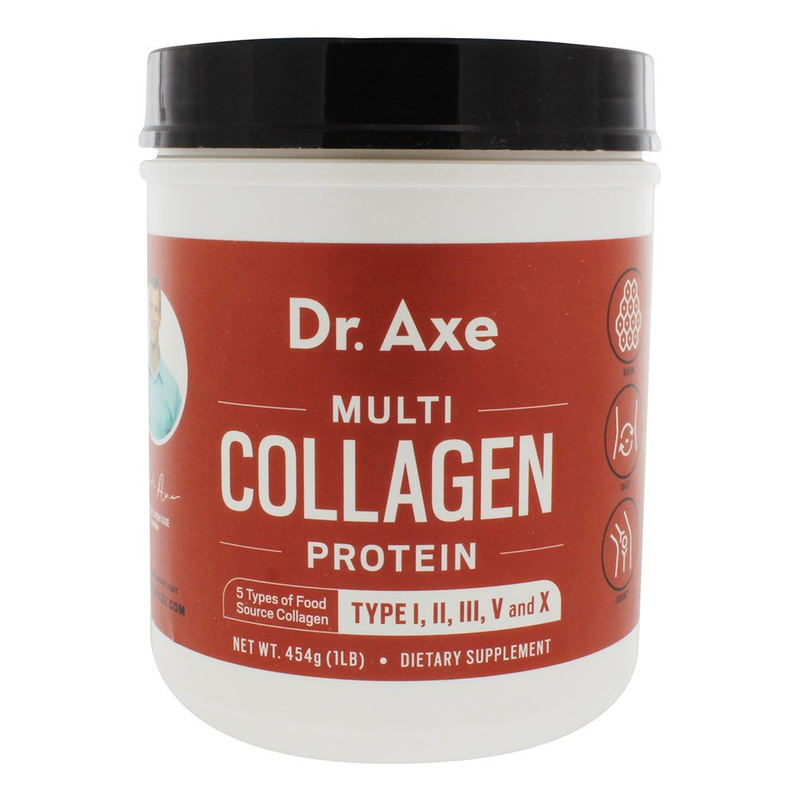 Dr. Axe Multi Collagen Protein Powder contains Collagen Type I, II, III, V and X from Four Food Sources (beef, chicken, fish and eggshell membrane). Promote healthy skin, Support healthy digestive function, Support healthy joints. 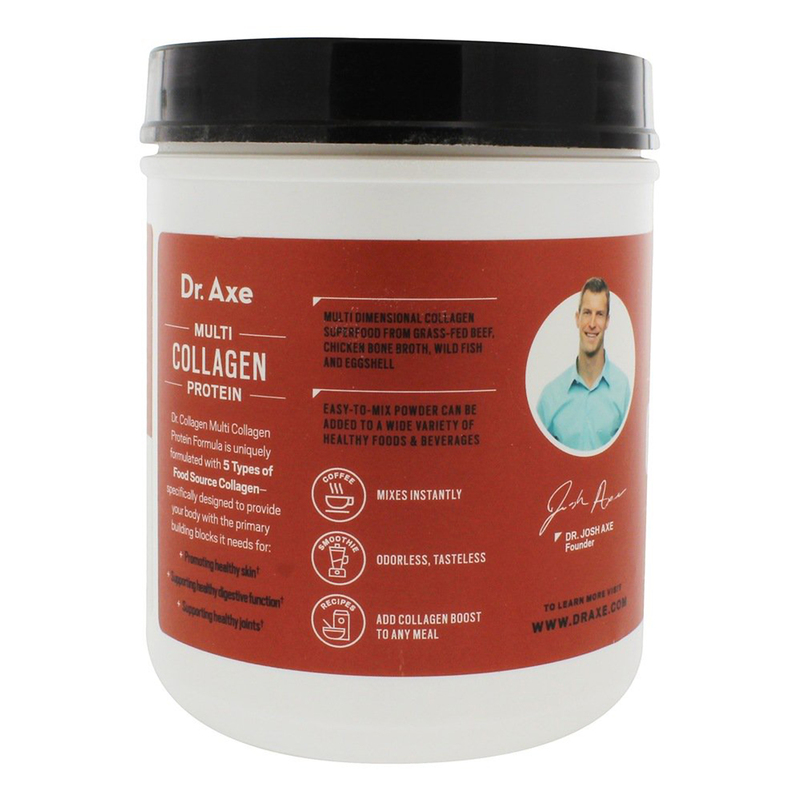 Mixes Instantly, Odorless, Tasteless, Adds Collagen Boost to Any Meal. Contains No Added: milk, shellfish, tree nuts, wheat, peanuts, soy. Made on equipment that also processes milk, eggs, fish, tree nuts and soy. 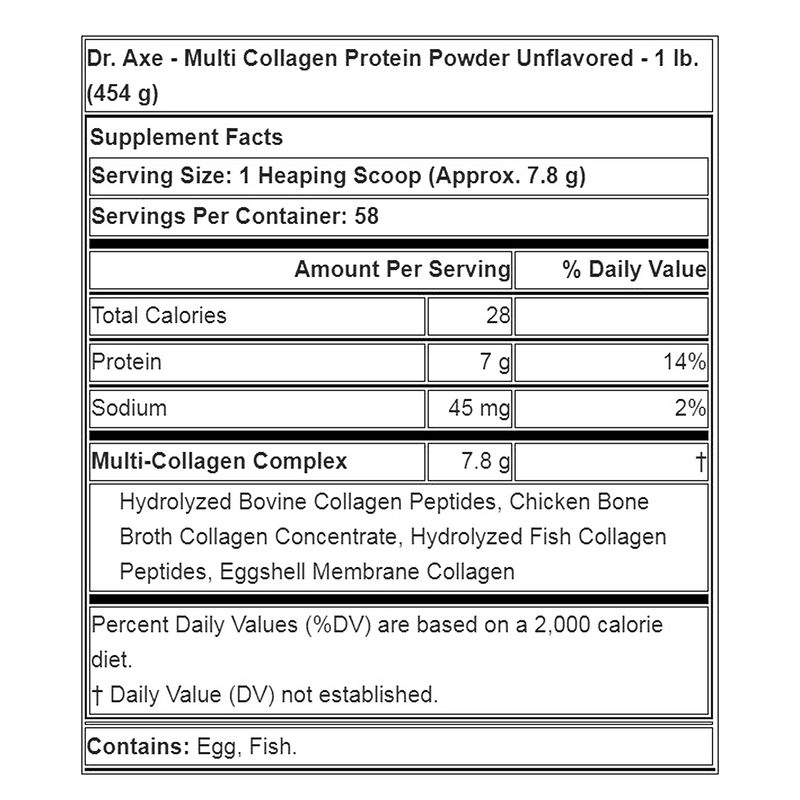 Hydrolyzed Bovine Collagen Peptides, Chicken Bone Broth Collagen Concentrate, Hydrolyzed Fish Collagen Peptides, Eggshell Membrane Collagen. Contains No Added: milk, shellfish, tree nuts, wheat, peanuts, soy. Made on equipment that also processes milk, eggs, fish, tree nuts and soy. Adults take one heaping tablespoon one or more times daily with 8 ounces of water, juice, coffee, tea or your favorite recipe. Contains: Egg, Fish. If you are pregnant, nursing, allergic, have a medical condition, or taking any medications, consult a doctor before using this or any other dietary supplement. Do not use if product has been opened or tampered with in any way. Keep out of reach of children. Color and odor may vary from lot to lot. Store in a cool, dry place. NOW Foods Eggwhite Protein 100% Pure, 1.2 lbs. NOW Foods Whey Protein Concentrate Natural Unflavored, 1.5 lbs. NOW Foods Whey Protein Isolate Vanilla, 1.8 lbs. NOW Foods Pea Protein 100% Pure Non-GMO Vegetable Protein Dutch Chocolate, 2 lbs.